If (bear with us here) T.S. Eliot were to rise from the grave, and were he, in this reincarnated state, to dedicate himself, improbably, less to matters of the feline variety but instead to a taxonomy of fast food dining experiences in London — let's call it Old Possum's Book of Practical Chips, say — then he may have cause to name the fried spud served up at Victoria Park's Fish House as Macavity, the Mystery Chip. Why? Because when it reaches the mouth — and there's the wonder of the thing — the chip's not there. Well, it's certainly there of course, or at least in the gastrointestinal tract and on its way to a date with some aggressive stomach bacteria. But the chip slips so limply through the mouth, and offers not even the merest temptation to the taste buds, that it's scarcely credible to believe you've eaten it at all. 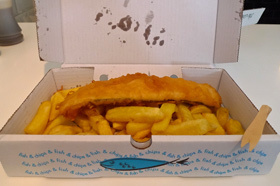 Fortunately, an unhealthily generous helping of quite excellent tartare sauce meant the chips weren't chucked, but compared to some of the quality specimens tasted on this ongoing journey, the Fish House wasn't really up to the challenge. Which is a shame as the venue itself is excellent. Located on a nicely gentrified strip of south Hackney, the Fish House is split between a takeaway (from where we got our meal) and a posher restaurant with an impressive selection of seafood (at correspondingly posh prices). In summer the tables spill out onto the street, lending an unexpected Mediterranean air to Lauriston Road. See more in the series.